It is hereby informed to all the concerned that the Technical Teacher's Certificate (Lower Grade) Theory Examination for the candidates who have undergone 42days TTC Summer Training Course August 2018 and the failed candidates of earlier Examinations is scheduled to be Conducted on 19-08-2018 (Sunday) at Hyderabad, Warangal, Nizamabad, Nalgonda and Karimnagar Centres. The Examination will be conducted as per the Time-Table given below. 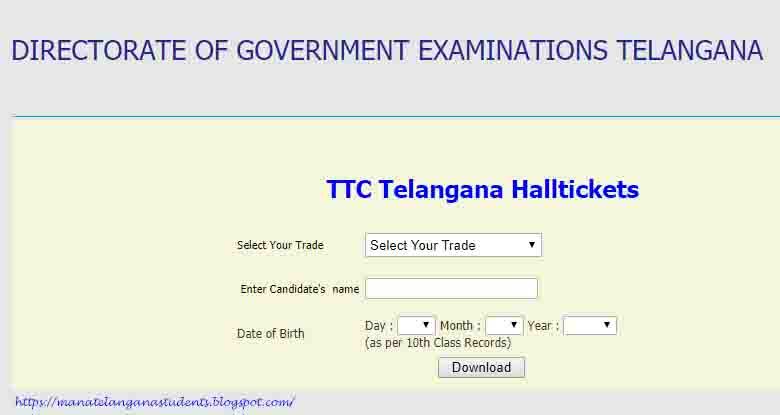 The Hall-Tickets intimating the Roll Numbers and Centre of the Examination will be sent to the Centres and the Candidate can also download the Hall-Ticket from the website www.bsetelangana.org from 11-08-2018.